Dion Bailey is an interesting type of tweener that some schemes call an ‘Elephant’. He’s a linebacker/ defensive back hybrid that the USC Trojans used all over the field from 2011 to 2013. He earned the Pac-12 honor for being the Defensive Freshman of the Year when he had 81 tackles, 2 tackles for loss, 2 sacks, 2 interceptions, 2 pass deflections, and 1 forced fumble in 2011. He’d settle in at linebacker for 2012 with similar numbers (80 tackles, 1 sack) but have 4 interceptions, before bouncing over to safety in 2013, with 62 tackles, 7 tackles for loss, 1 sack, 5 picks, and 6 pass deflections. 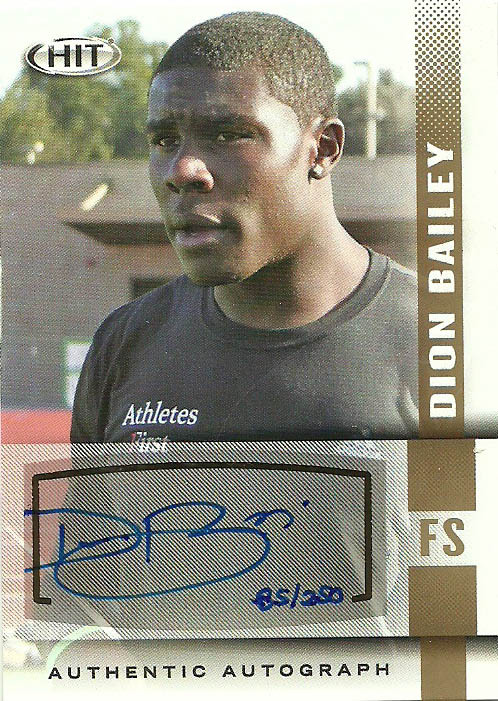 Dion declared for the 2014 NFL Draft, but went unselected. He spent the next year on and off the Seahawks practice squad and injured reserve lists at strong safety. Dion started 1 game and had 3 total tackles for the Seahawks. He was signed by the New York Jets in 2015, and actually saw playing time in 5 games (1 start) with 18 combined tackles, .5 sacks, and 2 pass deflections backing up Calvin Pryor. He was granted an injury release in 2016 and is for all points and purposes retired from the sport. Dion spent some time working internships in political government over the last year or two. He studied public policy at USC and has dreams about running for Mayor of Los Angeles.